Next-generation technologies for clinical diagnosis and therapy will require new tools to understand cell function and therapy effects. We are developing new quantitative analysis technologies based on imaging to understand how cell signaling occurs in neurons and tumor cells in order to reveal how drugs impact their interactions. We are further developing analytical approaches to quantitatively describe macromolecular drug delivery. We are attaching our next-generation fluorescent quantum dots (QDs) to proteins to monitor signaling processes in living cells in the context of cancer and neurodegenerative diseases. One major outcome is that we can quantitatively analyze signaling events at the single-cell level by counting absolute numbers of molecules that have become activated (submitted). In ongoing work, we are using QDs as a metric of single-cell signaling to understand how cells heterogeneously respond to drugs. With the Paul Selvin Lab (UIUC Physics), we are using compact quantum dots for imaging in neurons where previous QDs are too large to enter synapses (Angew. Chem., 53: 12484 2014 and Bioconj. Chem., 25: 2205, 2014). Small QDs now allow accurate resolution of individual neurotransmitter receptors in living neurons to determine how these receptors change during processes underlying memory and disease. 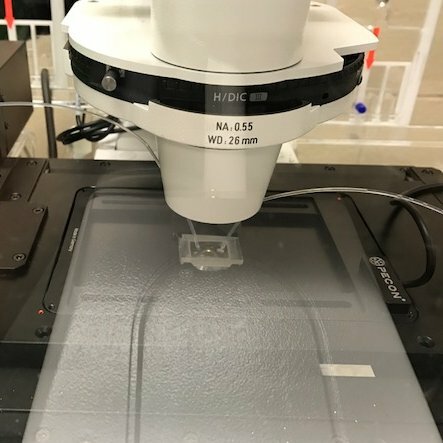 We are also applying compact QDs in breast cancer cells to map cellular processes underlying metastasis and invasion (Nano Lett., 15: 5025, 2015 and Adv. Mater., 27: 5512, 2015). Some of the techniques used in this work to apply QDs and molecular imaging for the study of cells was recently reviewed (Optical Nanoscopy & Novel Microscopy Techniques, 2014). The inability of macromolecules and nanoparticles to freely access molecular targets inside cells has been an ongoing problem for pharmaceutical biologics and nanomedicine. We are using single-molecule imaging in living cells to analyze and optimize this process. We developed a new analytical tool based on single molecule imaging to quantitatively reveal the heterogeneous distribution of nanoparticles in cells based on a combination of optical properties and diffusive mobility (Nat Comm., in revision). We have also been investigating the cellular entry of “flat” nanoparticles. Compared with common spherical nanoparticles, those with platelet-shaped induce cellular entry with orders of magnitude higher rates (J. Am. Chem. Soc., 138: 64, 2016). We are currently exploring whether these design rules for inorganic nanomaterials further apply to translational organic nanomaterials for therapeutic delivery.